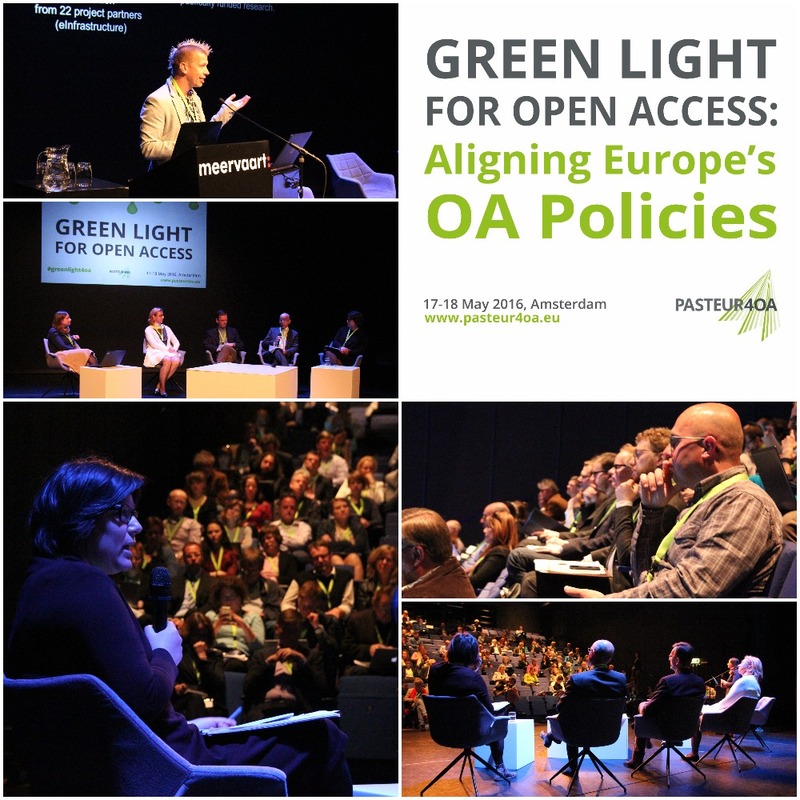 Open Access was in the spotlight on 17-18 May at the Green Light For Open Access Conference in Amsterdam. The conference, an officially associated event with the Dutch Presidency of the European Union, attracted some 150 experts, funders, research institutions, publishers and policy makers from as far away as Australia. Organised by the EC-funded project PASTEUR4OA, all aspects of the Open Access landscape — from the current situation to future developments — were discussed during the conference. Ron Dekker, Director of Institutes at the Netherlands Organisation for Scientific Research (NWO) and Project Leader Open Access for the Dutch presidency of the Council of the European Union, and Gerard Meijer, President of Radboud University, were among the 26 speakers. Some 150 experts took part in the Green Light For Open Access conference in Amsterdam on 17-18 May. Photo by LIBER, licensed under CC BY 4.0. A key discussion point was the more than 400 Open Access policies in place across Europe. Delegates called for a focus on the content of these policies: what should be their common denominators and what can be learned from policies that are already established? The topic of sustainability dominated Day 2 of the conference, with debate centering around what would be needed in terms of infrastructure, advocacy and policies to ensure that Open Science leads indeed to better and more sustainable research practices. “I think there’s an incredible opportunity to work together to deliver a more open scholarly infrastructure and we should now seize that opportunity,” said Ben Johnson, Research Policy Adviser at HEFCE. Change from publishers was seen as a key part of the change required in the coming years. “I would like the publishing ecosystem to change during the coming three years so that our researchers have new, high quality Open Access publishing possibilities,” said Kristiina Hormia-Poutanen, President of LIBER, the Association of European Research Libraries, and Director of Library Network Services at the National Library of Finland. One of the main achievements of the Pasteur4OA project has been to gather advocacy materials, which can be used by policy influencers across the European Research Area. The project has helped to put Open Access and Open Science policies on the agenda of institutions and policy makers across Europe. During its EU Presidency, the Netherlands is working towards a common EU approach to open science, including open access to scientific publications and the best possible reuse of research data. In April, it launched the Amsterdam Call for Action on Open Science. Presentations and the programme from the Green Light for Open Access conference can be consulted on the PASTEUR4OA website.